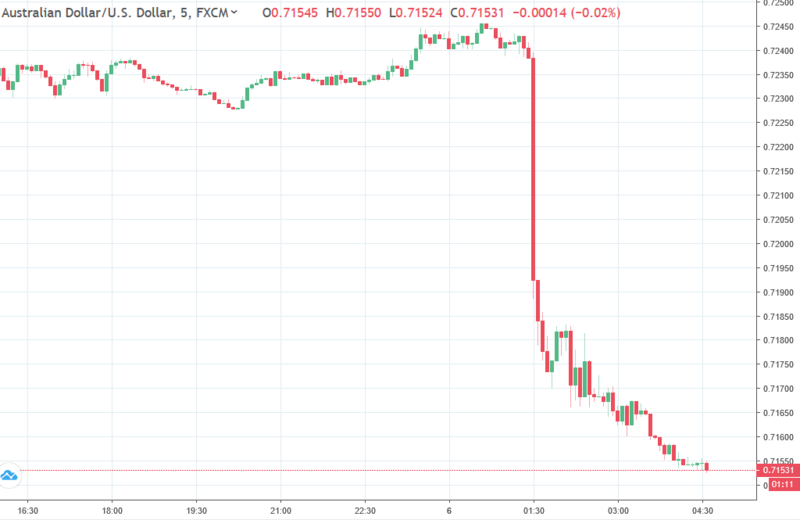 The Australian dollar dropped sharply today in response the Reserve Bank of Australia Governor Lowe backing away from the Bank's oft repeated 'next rate move is likely up' bias to a neutral 'rate outlook is evenly balanced'. Australia financial press now: "RBA shifts to neutral"
Want some RBA charts? Here you go. NZD/USD followed a similar pattern to the AUD but with smaller point moves. USD/CAD is net higher on the session alongside. USD/JPY was a mover, falling during President Trump's State of the Union address. The speech touched on familiar themes, and China got a harsh mention on its trade policies. EUR, GBP, CHF are all little changed for the session. Reminder, Singapore, Hong Kong and China markets were all closed today, as was New Zealand. Hong Kong and China remain closed tomorrow (China closed on Friday also).